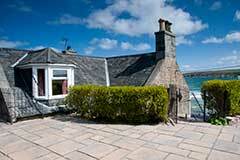 With possibly the best views in the picturesque fishing village of Sandend! A real home from home with great views over the river to the dunes. 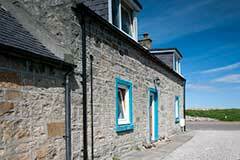 A traditional fisherman’s cottage in the quiet Seatown area, yet in walking distance to all the necessities! No.6 Seatown has the main bedroom, bathroom and lounge on the ground floor, with a kid’s bedroom and den upstairs. It has a sheltered and secluded garden. There’s something about the scale of this place, the North East of Scotland, between the mountains and the sea. You can roam for miles across great estates, expanses of moorland, ancient Caledonian forests, rolling farmland, vast dunes, wide sandy beaches and expansive coastlines. History is writ large here too. Ancient sites and symbols mark this as a heartland of the ancient Picts. In the millennia that followed, no fewer than 300 castles were planted here. And of course this majestic place has long been loved by monarchs … and by the salmon that return each year to power upstream in the fast-flowing snow-fed waters of the Dee, the Don and the Spey. It’s a place of big skies and wide horizons, loved for its fresh clear air and the quality of its light. “The Northern sky is a beautiful thing” says Burt Lancaster in cult movie Local Hero, filmed along this coast. In summer, the light up here is special, days are near endless, sunsets stretch out, darkness is brief. In winter, nights are deep and long and starry – and on occasion spectacularly lit by the Northern Lights. 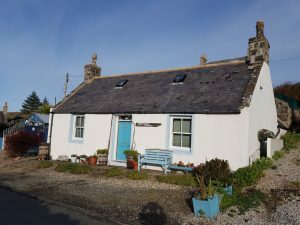 You can still hear words from an original Scots language – Doric – and feel its distinctive culture alive in its genial “couthie” people and its “affa fine” traditions – not least the fiddle-playing, the bothy ballads and the highland gatherings. Doric is in the warp and weave of this self-reliant place … a place that’s used to being off the tourism track, known rather as a seat of learning and for its natural resources – its granite, its oil, its fish, its beef, and its whisky. All is sea and sky at first. Then sandy bays and rugged cliffs come into view, with a string of little seaside towns and villages. The Moray Firth coast is one of the world’s outstanding coastlines, says the National Geographic. 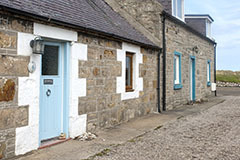 Not just for its natural beauty with plentiful wildlife – there are dolphins, seals, puffins and other seabirds in abundance – but for its “strong community feeling”. And the two are surely linked. For right around the coast nature dominates … and people have always pulled together to get things done. Tiny beautifully preserved 17th, 18th and 19th century harbours have rich histories of Baltic trade and herring fleets. Fishing villages perch on clifftops or crouch precariously at the water’s edge, the oldest houses built gable-end on to the weather and the waves. Many with lighthouses to guide safe passage. There’s evidence of older history too. Burghead fort was one of the earliest power centres of the Picts. Craggy clifftops, great dunes and wide beaches stretch for miles, and shifting sands at Culbin where a small farming township was lost during the 17th century. Among the ancient coastal sites are Findlater Castle, open to the elements, with precipitous drops to the sea below. The old ways are still valued: traditional boats still built, crafts thrive, Doric words are spoken and Doric ballads are sung. The people – whether born here or more recently arrived – seem rooted and shaped by this far-flung, salty aired place.